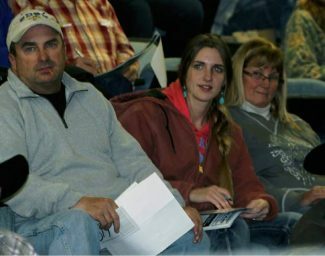 Location: Buffalo Livestock Auction – Buffalo, Wyo. 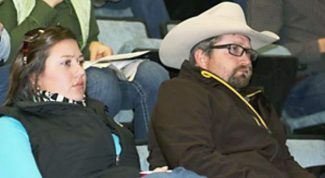 "Calving Ease Genetics with a Live Calf"–Redland Angus hosted another packed house for their annual January calving ease yearling Angus bull sale. 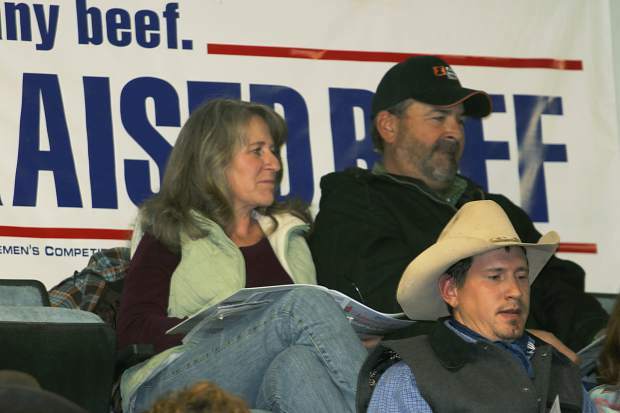 Kendrick and Sharon Redland have built a reputation for providing labor free genetics for the commercial cattleman. Redlands want their cows to calve on the range, and thrive on the range, with few additional inputs. I personally see more and more ranchers coming to Buffalo to buy into this program. The Redlands use proven predictable sires that produce calves that are born easily with extreme vigor at birth. To do this, they maintain a moderately framed cow herd, with good udder quality and exceptional mothering abilities. Like always, extensive ultrasound data was listed on each bull. Ribeyes were all in a good range, with some as high as 16.10 sq. in. The weather was, again, beautiful on sale day, and a very fast-paced, exciting sale took place. 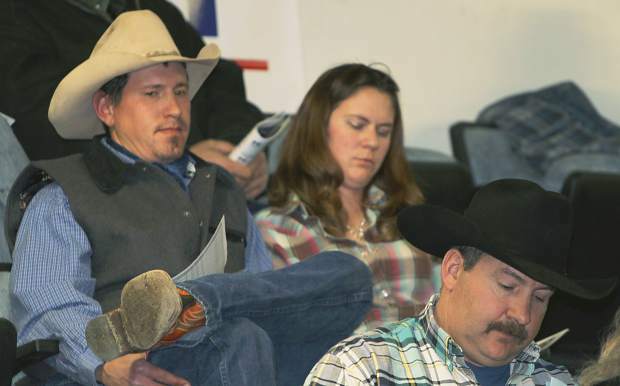 Bidders were on the seats from Wyoming and all the neighboring states. The top selling bull of the day was Lot 30, selling for, what I believe to be, a record price at Redland Angus. He sold to Red Bank Angus from Wyoming, for $21,000. This thick-made son of GDAR Game Day 449 was out of a daughter of OCC Missing Link 830M. With just a 74 lb. birth weight, this bull really grew to post a weaning weight of 895 lb. He had a 14 sq. in. rib eye and an IMF score of 4.80. His EPDs are CEM 5, BW -0.1, WW 60, MILK 28, and YW 100. Lot 105 sold for $10,000 to the Van Dusseldorp Ranch from South Dakota. Here was a son of OCC Paxton 730P who was out of a daughter of GDAR Game Day 449. He had EPDs of CEM 8, BW 0.3, WW 50, MILK 20, and YW 86. He hit the ground at 69 lb., and grew to a weaning weight of 795 lb. The Brown Ranch from Wyoming bought Lot 21 for $9000. He was a son of GDAR Game Day 449, and out of an Emblazon 854E daughter. With EPD's of CEM 7, BW 0.5, WW 54, MILK 20, and YW 90, he was a well-rounded package. He had a 76 lb. birth weight and a weaning weight of 833 lb. The Burch Ranch from Montana was back at the Redland sale to buy Lot 106 at $9,000 and Lot 66 at $8,500. Lot 106 was sired by OCC Paxton, born at 69 lb., and weaned at 825 lb. Lot 66 was a son of OCC Emblazon 854E, with a 79 lb. birth weight, and a weaning weight of 832 lb. Lot 81 sold for $9,000 to the Van Dusseldorp Ranch from South Dakota. This son of OCC Paxton 730P was out of a daughter of GDAR Game Day 9222. He had a 66 lb. birth weight and weaned at 805 lb. This was truly another great sale for the Redland family–and, remember, their pre-sale meal is worth the 270 mile trip.